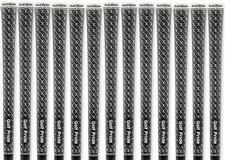 Golf Pride Z-Grip Cord Black Midsize Golf Grips -(Set of 13 Golf Grips) - $109.95 - GolfersEdgeOnline.com - Best Golf Equipment On The Web! From the #1 Grip on Tour comes the Z-Grip Cord, the firmest cord grip available from Golf Pride. Combining two layers of texturing for feedback and control, the Z-Grip features a deep “Z” shaped texture pattern that winds vertically around the grip for control, while a heavy cord texture throughout provides moisture management. This design pattern is complemented with a white end cap and distinctive white body paint fill. If you have any more questions about the Golf Pride Z-Grip Cord Black Midsize Golf Grips -(Set of 13 Golf Grips) ; do not see the model you are looking for; need custom options; or prefer to not purchase online, then please call us at (630) 656-1291.